As per the WHO Vaccine Management Handbook, "How to monitor temperatures in the vaccine supply chain" (July 2015) it is considered best practice to use 30DTRs as temperature monitoring devices for vaccine refrigerators because 30DTR devices (as opposed to stem thermometers) not only provide spot temperature readings at the time of inspection but they can store the excursions and provide evidence of what happened between the manual readings. What is a 30DTR device? 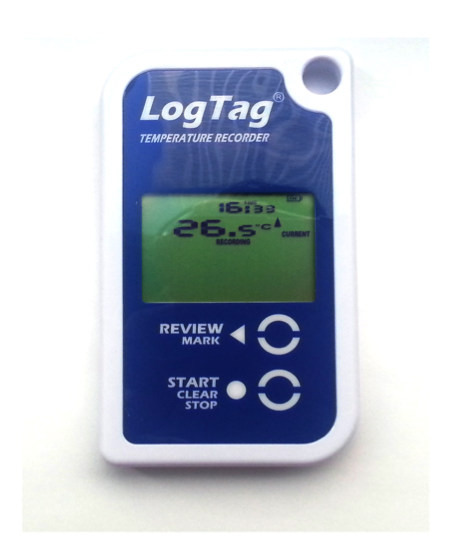 30DTRs or 30-day-temperature-recorders are small devices that can continuously measure temperature for 30 days (or 60 days for the FridgeTag 2) and log the history of the measurement. Temperature readings appear on a display that also shows pre-defined and factory programmed temperature alarms if they occur. The criteria for low alarm is set to -0,5°C or lower for 60 consecutive minutes and the high alarm is set to +8° C or higher for 10 consecutive hours. The alarms show when a temperature excursion has occurred that might reduce the quality/potency of the vaccines and health workers must check the Vaccine Vial Monitor (VVM) of the vaccines in case of high alarm and they should perform a shake test, in case of low alarm. If the shake test is not possible, then the vaccines should be discarded (Posters with a description of the VVM checks and showing how to perform a shake test can be found in the material of the training section). 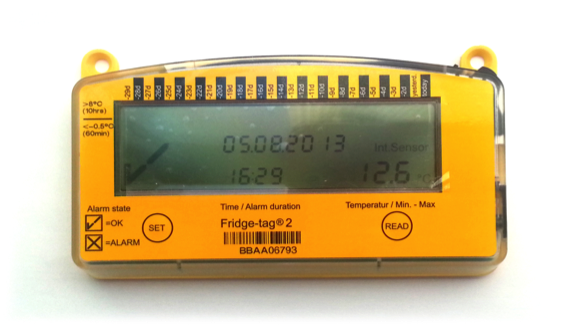 Health workers should read the temperature from the 30DTR devices every day, twice a day, morning and evening and record the readings in the temperature monitoring chart (sample in related resources below) affixed to each refrigerator. Any alarm should be noted in the chart. If the clinic has been closed for the weekend and temperature reading was not possible, health workers should perform the reading of minimum and maximum temperatures and alarms for the previous days. The data can be read, downloaded and converted for analysis but after 30 days (or 60 for the FT2) , it is overwritten and cannot be retrieved. Calibration accuracy of +/- 0,5 to +-1°C is programmed to last as long as the battery operating life which is 2 years minimum. Non-replaceable lithium batteries power them and their primary use is in refrigerators containing temperature sensitive vaccines at intermediate stores and health facilities. There are currently 2 pre-qualified products with very similar functionality. Choosing one or the other is more a questions of taste (size of the display, universal serial bus/USB port versus cradle). Some countries conducted a workshop for the EPI personnel to get user’s input for the selection of a model and this was identified as a excellent practice, as the staff felt involved in the project from the very beginning. The protocol of this workshop (in French and in English) can be found in the related resources on this page. The main challenge of 30DTR implementation is making sure that the data is shared and used, i.e. that it drives action. Health workers use the 30DTR data to immediately react to temperature excursions and take corrective actions to protect the vaccines but in case of structural problems with the equipment, the issues highlighted by temperature monitoring need to be passed on to a higher level of responsibilities and empowerment as health workers cannot make the decision and do not have the budget to replace a fridge or even to procure spare parts. As developed in the first part of this website, a system needs to be built up for the data to be escalated to the staff empowered to act on it and this system should be as simple as possible, though providing the necessary minimum information to the EPI decision-makers. Many models for collecting and communicating 30DTR data from health facilities to higher levels have already been developed: off-the shelf solutions or customization of the SMS gateway and the cloud-based database. These existing solutions need to be evaluated against the specific objectives of the EPI programme and the country context. This specification describes the performance requirements for programmable electronic temperature and event logging systems with remote alarming and remote, periodic, and automatic reporting for monitoring storage conditions in the administrative levels of the cold chain. This WHO document provides the PQS performance technical specifications for the 30 Day electronic Temperature Recording devices. This WHO userguide introduces the Fridgetag2 and provides guidelines on preparations for introduction and programme adjustments required, English version. This document is a report from a workshop organised in Madagascar in August 2013 for choosing a 30DTR device and for training. LogTag setup brochure or quick start guide. Supplier setup brochure for the FT. This WHO video in English shows how to set up the date and time and temperature scale and how to change if the parameters were not set correctly on the Fridgetag2. This WHO video in French shows how to set up the date and time and temperature scale and how to change if the parameters were not set correctly on the Fridgetag2. Guidance issued by UNICEF for the implementation of systematic temperature monitoring systems using 30DTR at Static Delivery Points (Health facilities). Sample of a temperature monitoring chart in English for use with temperature recorders. This format includes space for recording of the alarms. Sample of a temperature monitoring chart in French for use with temperature recorders. This format includes space for recording of the alarms. Alternative sample of a temperature monitoring chart in French for use with temperature recorders. This format includes space for recording of the alarms.